It’s a bit unusual – hating bleach – and particularly using that hatred to tell a story about authentic business success. 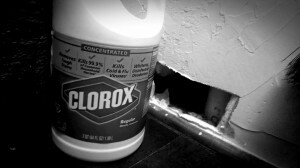 But I was inspired today by a bottle of Clorox – yes – the name brand bleach! About 17 years ago I was at the club where I worked out regularly. The pool was right outside the fitness room, and was being worked on and cleaned. By accident, a worker mixed the chlorine with ammonia. If you didn’t know before you will forever after remember never to mix bleach and ammonia. The result is a highly toxic gas that can permanently damage lungs and potentially kill. I have always been highly sensitive. I hear things that others don’t hear and wake up to slightest hint of light. Tags inside all my clothes have to be cut off . Though I have traveled the world and can roll with different environments, my home environment was chosen to control for noise and light and interruptions and temperature. When the chlorine mixed with the ammonia on that day 17 years ago, I ran coughing and eyes watering, from the building. I was lucky. EMS services had already been called and after a short while breathing oxygen, I went home. Those working in the pool area itself were in bad shape. Some brought out on stretchers and all sent to hospital due to the intensity of the effect on their lungs. Ever since that day, I cannot tolerate bleach at all. I would get an instant headache from even a hint of the odor. Indoor swimming pools make me crazy. Water glasses in restaurants sterilized in bleach, I can’t drink out of if I can smell it at all. In the past few years it’s finally gotten better. But for a very long time, I would walk out of buildings or even hotels, if the bleach smell from cleaning was evident. It would make me quickly sick. Today, I had a builder friend come and cut open my drywall to remove two dead mice who had met their demise between the tight studs in my pantry wall. For days I had heard them trying to get out of the too tight space. Then it was silent. After the poor little mice were removed I had to spray the hole and surrounding area with bleach and water. It’s the recommended action for this type of situation. I took a deep breathe in – held my breath – and sprayed. After saturating the area I left the room. Later tonight, while cooking dinner, I smelled the bleach. It wasn’t overpowering and I went on with my chores. As I moved into the walk-in pantry to put things away, the bleach scent was there. I expected to automatically hold my breathe, but instead I had an unexpected reaction. The bleach smell was so much better than the dead mouse smell that I found myself smiling. The smell felt clean. I didn’t love it, but I liked what it signified – no small gray rotting mouse bodies in my wall. Bleach was the right tool for the job! It did it’s job well! The bleach is exactly what it is. It’s authentic. It smells strong and cleans and disinfects well. Today it allowed me to walk into my kitchen without scrunching up my nose and squirming. In business today, your audience is craving that level of authenticity from you! The tide has turned. There is no place any longer for manipulative sales pages and underhanded marketing tactics. Authentic business success is about you and your company being really, truly clean and clear about who you are and what you do. Just like bleach. You know what it is and what it does. It smells strong and cleans and disinfects. Can you say the same thing about your business mission and practices? A message in a bottle! This is a nice clear statement about authenticity and clarity. Overcoming a hurt from the past (that combo is mustard gas btw, as used in WW1) takes a new positive psychological impulse stronger than the old negative residual. Glad you overcame that. Thanks for your comment Wouter. I did not know that chlorine and ammonia were the components of mustard gas. Wow. And yes, there was both psychology and physiology in this one. I think the physiologic actual was quite powerful for a long and after that I just hated bleach!